Don't be an unprepared Bounty Hunter. Pack your supplies in the Star Wars Boba Fett Backpack and be prepared for any occasion. Featuring over 6 zippered storage areas, the Star Wars Boba Fett Backpack design is inspired by Boba Fett's iconic appearance. Measures approximately 19-inches x 17-inches. Ages 14 and up. 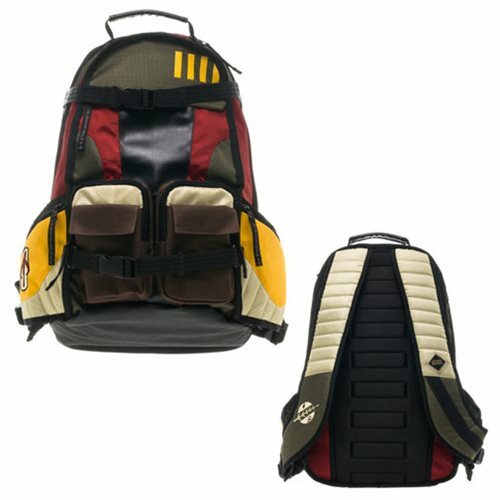 The Star Wars Boba Fett Backpack features include: 5 exterior zippered compartments, 2 exterior Velcro pockets, 2 side exterior mesh divided water bottle pockets, 1 main interior compartment with 5 internal organization pockets, 3 pencil pockets, 1 mesh pocket and key chain hook, 1 fleece lined compartment, utility straps, handle, and cushioned adjustable shoulder straps.